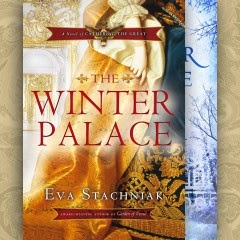 My guest today is Eva Stachniak author of The Winter Palace, her novel of Catherine the Great which was an international bestseller, and has been included in The Washington Post 2012 list of most notable fiction. Empress of the Night, her second Catherine the Great novel, has just been published in Canada and the US. Itis also available in the UK, Australia and New Zealand as an e-book. Eva was born and raised in Wrocław, Poland. She moved to Canada in 1981 to pursue her post-graduate degree in English at McGill and now lives in Toronto. She has worked for Radio Canada International (Montreal) and Sheridan College (Oakville) where she taught English and humanities. 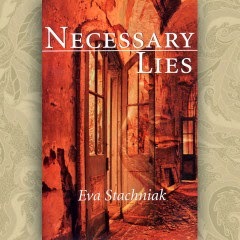 Her debut novel, Necessary Lies, won the Amazon.ca/Books in Canada First Novel Award in 2000. It was the love of reading at first. I’ve always been an avid reader. Ever since I realized that authors were real people, I wanted to be a writer, imagine and tell my own stories. But I found the courage to actually do it only after I emigrated from Poland to Canada in 1981. My new Canadian friendships always began with questions about my homeland. It was the time of the Solidarity crisis, when Poland was on everyone’s lips. I began by telling stories of the city I was born in and its complicated Polish and German past. Stories turned into novels…and here I am. 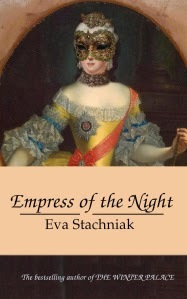 Empress of the Night is the second novel in my two-book project on Catherine the Great. Both were inspired by the formidable Russian Tsarina who always loomed large in Polish consciousness. It was under her rule that Poland was wiped out from the map of Europe. I was always aware of Catherine’s existence and her powerful presence, but only when I decided to write about her that I saw a woman and a politician behind the empress. In The Winter Palace I explored the influence Catherine the Great exerted on her political supporters and friends. In Empress of the Night I wanted to examine a powerful woman from the inside, at her moments of triumph and defeat. I wanted the reader to understand better what it meant to be empress of 18th century Russia, an upcoming political power, and what it cost her. I’ve written three novels rooted in the 18th century, because this is when the modern era began. Political decisions made at that time still touch our lives. Poland—partitioned in the 18th century—regained her independence only in 1918, at the end of WWI, which also saw the end of the Romanov rule of Russia. The current Crimean crisis can serve as yet another example, for it was Catherine the Great who took the Crimea from the Ottoman Turks in 1783. I also have to confess that 18th century women attract me more than their 19th century daughters. They are much more earthy, unashamed of their sexuality, ready to take power if given half a chance. Very modern in many ways. I read biographies of all my major characters; I read their memoirs, if they left any, and letters. I also talk to historians, and anyone who can shed light on any aspect of my character’s lives. A doctor to whom I described Catherine’s symptoms diagnosed her with diabetes, a detailed not mentioned by her biographers. I travel to places I write about. I need to position myself in the physical space where I set my novels. In St. Petersburg I walked all over the oldest part of the city, from The Winter Palace to the Nevsky Prospect, to Vasilyevsky Island, the Peter and Paul Fortress, along the Embankment, walks I describe in my novels. I visited other suburban palaces where Catherine the Great lived—Peterhof, Tsarskoye Selo—and where her traces are still very much visible. I also visit museums and art exhibits, looking for pictorial representation of life at different historical periods. I search for the details of ordinary lives, a dog’s collar, the shape of a pitcher or flower vase, a child’s toy. It’s a hard question for there have been so many, starting from the beloved writers of my childhood, Astrid Lindgren, Mark Twain, Lucy M. Montgomery. More recent influences include Hilary Mantel, a genius of historical novel writing, Kate Grenville, whose The Secret River is one of my favourite historical novels of all times, Rose Tremain whose Music and Silence I often return to, and Penelope Fitzgerald whose novels may seem short, but they manage to contain whole worlds. Leave a blank space and do something else. Read poetry. Garden. Go for a walk. Something always triggers an association. I started writing when I was in my forties and maybe this is why I find this admonition to be confident, to go where my imagination takes me, resonates with me. I take the word success to mean many things. Satisfaction, a sense of purpose, a deep joy of spending my days in the flow of work I love. Write and read every day. Do not wait for inspiration. It will come when you are working. Polish your writing until it becomes smooth and hard and you cannot polish it anymore without damaging it. Then—and only then—show your work to your trusted readers. Listen to their comments carefully, with an open mind, especially if they do not praise you. Criticism may hurt, but if it is merited and free of malice, it makes you grow. There is nothing more sobering than making your reader laugh when all you wished for were tears. I’m now working on a book set among Russian exiles in interwar Europe—thus closing the Russian theme of my last two novels. I’m still researching these years, the last decade of the Russian empire before the Revolution of 1917, the fate of Catherine’s descendants, and the wonderful explosion of art that took place at that time. I study the Ballets Russes, dancers, choreographers, musicians and painters who dazzled Europe with their art, a vibrant, creative group, tightly woven into the cultural tapestry of Europe. I find their lives full of passions and drama. This is what I want to write about. Many thanks for sharing your sources of inspiration with me, Eva. I hope Empress of the Night is a massive success, and I’m glad Australian readers have the chance to buy it here, too. You can learn more about Eva and her books on her website, and she would love to connect with you via Facebook and Twitter. The Winter Palace re-imagined the rise of Catherine the Great through the watchful eyes of her servant. Now, in Empress of the Night, Catherine takes center stage, reliving her astonishing rule over an empire, and the sacrifices that made her the most feared and commanding woman of her time. Empress of the Night is available in all Amazon stores including Amazon US, Amazon Canada, Amazon UK and, of course, Amazon Australia.